An Iraqi Kurdish journalist has been released after 131 days in a Turkish prison, his employer Vice News says. Mohammed Rasool was detained along with two British colleagues in August and held on terror charges. Jake Hanrahan and Philip Pendlebury were freed in September but Mr Rasool was kept in a high-security prison. His detention drew international criticism. Under the terms of his release, he cannot leave Turkey and he must report to a police station twice a week. "Rasool is now looking forward to being reunited with his family, friends and colleagues, who ask for his privacy to be respected during this time," Vice News said. 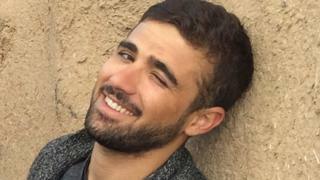 Mr Rasool, who turned 25 while he was detained, was working as a news assistant and translator for Vice when the three were detained in the city of Diyarbakir on 27 August. The three journalists had travelled to towns along Turkey's border with Iraq, the centre of renewed violence between Kurdish militants and government forces. Mr Hanrahan and Mr Pendlebury were released after 11 days and deported. Mr Rasool's detention came amid a spike in prosecutions of journalists in Turkey, many charged with anti-terrorism offences. His imprisonment was criticised by Vice and by a number of media advocacy groups. An Iraqi citizen, Mr Rasool previously worked as a news assistant for the Associated Press news agency and other media organisations.